When you think of mid century often the first thing that comes to mind is unusual shapes and bold colours. This is reflected in home furnishings in this theme, including and especially lights. Mid century is when plastics began to take centre stage and with the help of machines allowed for the creation of some vastly different and far bolder shapes and designs. Going back to go forward! Mid century is a trend coming back for 2015/16. Bring your rooms to life with bright colours and funky shapes! 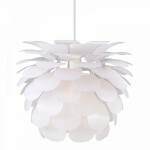 There are lots of ceiling pendants of this ilk and they’re great for hanging over kitchen islands and dining room tables. This gives you a great centre point for converting a rooms decor into the mid century theme. Follow up on home furnishings from the 1940’s to the 1970’s and add some pop art pictures and colours for great effect! Quite often homes of the mid-century had the walls painted white, purely and simply for the furnishings to be the stand out focal point, so take this into consideration and be brave with those colours. Many of the shapes and designs from this period still appear contemporary today, hence the revival of this trend! 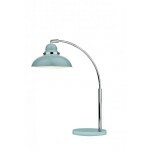 Retro style lights are perfect, we have a great range of retro ceiling lights, table lamps and wall lights. You may be familiar with the original artichoke light design by Poul Henningsen and manufactured by Lois Poulson which is iconic of the mid-century design, although it may be costly to obtain an original there are alternatives on offer which will provide you with a similar look such as the Motion (pictured below). These are great feature lights for this era. Don’t forget to re-introduce the wooden furniture! Wooden tables, chairs, beds and cabinets were vastly popular throughout the mid century. Ercol, not too long ago you would have been labelled as old fashioned for having any Ercol furniture, but quality comes around and it’s now a big part of the latest trend! Adding a dash of colour with chair cushions or bed spreads is a good idea and compliments the high quality wood well. You can even incorporate the wooden finish into your ceiling lights, there are some unique shaped ceiling lights with wooden features such as the Hotel Pendant. Why not light the wooden desks with something fitting? The Dynamo table lamp is an excellent lamp which is perfect for functional use and certainly looks the part. This lamp design is also available as a floor lamp. If you have the extra budget then antique retro items or replicas can really add to the ambiance, a radio from the 1950’s, a telephone from the 60’s. It can really make a difference. The mid century also saw a lot of patterned fabrics, so when it comes to hanging up the curtains be bold and source something bright and decorative. Floral, striped, geometric, there’s no definitive pattern. With things taking shape you may start to have a sense of Deja Vu, and this is good! You’ve managed to create an atmosphere that is very accurate and familiar to the mid century!